Vietnam wants to be friends with the best players! However, Vietnam has a lot to be done, he frankly said. For example, only 21 per cent of Vietnam’s small and medium-sized enterprises (SMEs) take part in global value chains, much lower than the 46 per cent in other ASEAN state members. The added value share of Vietnam in global supply chain has not met the target or potential either. Vietnamese companies join global value chains in simple stages and steps such as product assembling and contribution. These are downstream links of supply chains which are often of low and unsustainable added value. Domestic processors and manufacturers contribute less than 27 per cent of input value of foreign direct investment (FDI) companies in the country, while the rest is purchased from FDI makers or foreign exporters. In his speech, Prime Minister Phuc also affirmed the Government's commitment to play a constructive role in enabling and supporting domestic and foreign enterprises. Vietnam aims to upgrade and climb to higher rungs of global value chains, and enhance the connectivity between Vietnamese and FDI enterprises. The country is becoming one of the world's largest manufacturing factories and a backbone for transnational corporations to provide competitive products and services globally. The country’s trade opening now exceeds 200 per cent of the gross domestic product (GDP). Its political and social environment has always been viewed as stable in the region and in the world, which is even more meaningful in the context of political instability in some countries. At the same time, the nation’s macroeconomic factors remain steady with high continuous growth. Trade expands by 15 per cent a year on average. Public debt and inflation are well controlled. In the light of an opening and integrating economy, Vietnam now has trade relations with over 200 countries and territories on the globe. It has 20 billion-dollar exports posed huge potential of value added growth of supply chains. Vietnam’s ability to diversify supply chains is considered quite good in the face of international trade risks. “We understand that as we move forward, other nations also do the same in a global competitive environment. Therefore, Vietnam will need to make more efforts while businesses will have to strive for higher positions and stronger creativity, narrow the gap in the region, and make more contributions to the national development. Your success is also ours,” said Prime Minister Phuc. In his keynotes to the WEF ASEAN 2018, Mr Borge Brende, President of the World Economic Forum (WEF), highly appreciated Vietnam’s development in recent years. According to WEF’s latest statistics, Vietnam's GDP has doubled and exports have trebled since 2010. Vietnam is still maintaining a high growth rate, the stock market has doubled in the last two years, and inflation has been kept in check. Its GDP growth is forecast at 7 per cent this year. “Vietnam's poverty rate has markedly reduced, from 50 per cent in 1990 to 3 per cent now. This is a great achievement that I must congratulate the Prime Minister and Vietnam for their achievements. Vietnam has demonstrated to other countries with high poverty rates that poverty reduction is possible if appropriate policies are in place. The Government of Vietnam does not rest on its laurels. Moreover, Vietnam continues to have transformational changes,” he said. However, Vietnam still faces big issues such as high public debt which the Government has sought various measures to reduce. Dr Vu Tien Loc, President of the Vietnam Chamber of Commerce and Industry (VCCI), said that Vietnam has been among countries having most Industrial Revolution 4.0 talks in the past two years and is hoped to make breakthroughs to catch up with this revolution. According to a report released by the Global Entrepreneurship Network this year, Vietnam's start-up index ranked sixth out of 54 economies surveyed. AlphaBeta's research also ranked Vietnam second in technological investment environment and third in digital talent in the Asia Pacific region. “These are new advantages of Vietnam in the digital economy in addition to its traditional advantages such as a favourable geo-political position and geo-economy, socio-political stability, market size linked to free trade agreements, a young abundant workforce and low labour cost. Efforts for accelerating institutional reform, forming an enabling government, and placing people and businesses at the heart of development are also becoming new engines of the Vietnamese economy. 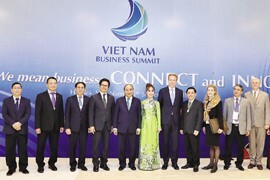 The Vietnam Business Summit is themed “Vietnam: We mean business. That is also our commitment to the whole world,” added Dr Loc.